Instituto Thomas Jefferson has asked my class to participate in their annual design/fashion show. They parade their customized blue-jean creations down a runway before an audience and jury. We will have our own pre-juried exhibit at HTHI to decide what 3 designs will travel to Mexico City as representative of the USA and HTHI. Can you turn jeans into a culturally, artistically and academically significant artwork? · ITJ will pay for me to travel to Mexico to participate as a judge. 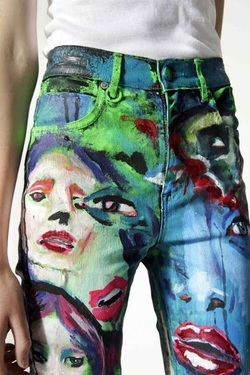 By any method you choose, express a theme or concept using blue-jeans as your canvas.